In the 1990’s, one would think that equality has been achieved and ensured to all Americans, but what happen in the 1950’s, 60’s, and 70’s still affects the present, such as the 1992 Los Angeles Riot. On March 3, 1991, suspected DUI driver, Rodney King, led the Los Angeles police department in a pursuit (“Riots”). When the chase ended, Rodney King remained resistant to the police officers’ commands (“Riots”). As a result, the four white police officers beat the unarmed felon, while other officers, who were at the scene, did not bother to stop the beating (“Riots”). The news media managed to recover some footage that showed Rodney King’s beating (“Riots”). People began to see how white police officers abused their power and use it against minorities (“Riots”). There were concerns about police brutality towards minority groups and racial tensions drastically increased (“Riots”). The footage outraged some minority groups and demanded the four police officers who were involved with the beating to be trialed (“Riots”). 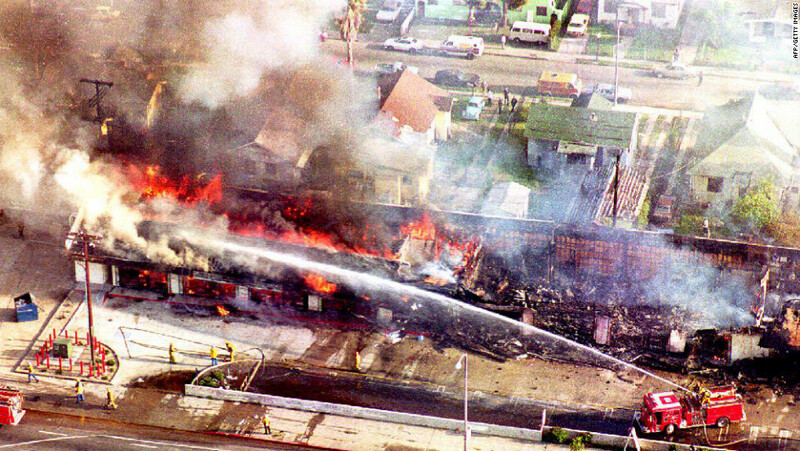 The court acquitted the four white police officers from any wrongdoings during the Rodney King’s beating, and that caused the 1992 Los Angeles Riot (“Riots”). Local police were unable to control and contain the riot; therefore, the governor of California called in the California National Guard and executed martial law (“Riots”). In time, the California National Guard and local law enforcement manage to end the riot, but it came at a terrible cost (“Riots”). There were 55 people killed, thousands injured, and over 1 billion dollars in damage (“Riots”). The four police officers were retrial and two were convicted for violating the Rodney King’s rights, while the other two police officers were acquitted (“Riots”). Although the racial tension between Americans and minority groups are starting to settle, there are some flaws in terms of discrimination and stereotypes in the justice system. Being a police officer is a dangerous job and it takes a great sense of skill and judge to become an officer of the law. However, there are some police officers who used stereotypes as their judgement and proceed with extreme prejudice. In 1992, Rodney King, an African American, led the Los Angeles Police Department in a high-speed chase. When the police officers apprehend him, based on the stereotypes, the police officers assumed he was dangerous. As a result, four police officers brutally beat him to a pulp. The media managed to get the footage of Rodney King’s beating and went to court. At that time, the judge and an all-white jury discriminate against Rodney King and decided to acquitted the four police officers. A major race riot followed and many people were injured. The four police officers were re-trialed and convicted two of the four police officers guilty. The legacy of the 1992 LA Riot diversified the Los Angeles Police Department and more police officers become aware to use their judgement instead of relying on stereotypes. In today’s society, the views of most police officers towards minority groups have changed and most of the time act with precaution. However, there are times where some police officers indiscriminately relied on stereotypes and assault or shoot suspect(s).